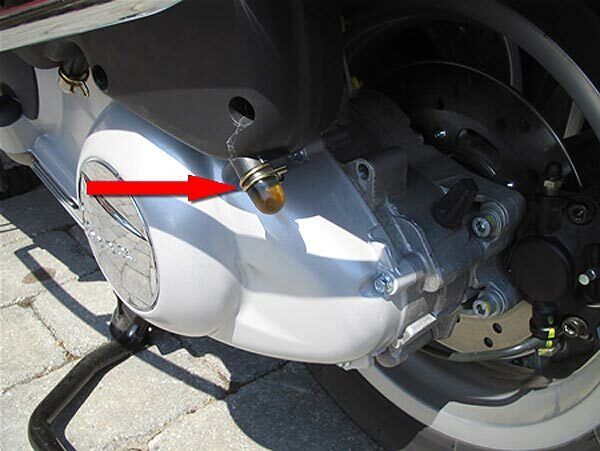 Modern Vespa : FAQ: What's that bubble filled with oil? FAQ: What's that bubble filled with oil? It's a drain for your air filter system. All modern Vespas are equipped with a wet foam type air filter element. The foam air filter element is treated with high-tack oil, prior to being placed in service and at routine maintenance intervals. Located at the bottom of the air filter housing, is either one (LX), or two (GT and GTS) clear rubber caps (i.e. bubbles). The purpose of these bubbles is to collect any run-off air filter oil, and provide convenient access for drainage. You can periodically remove the bubbles, and drain the excess oil into a suitable container. When replacing the bubble, be careful that its metal clamp is securely fastened. If you lose the cap, you'll have a hard time obtaining a factory replacement part. The modern Vespa air filter housing connects to the crankcase re-breather system. The crankcase re-breather can blow-back oil mist into the air filter housing. This will result in an excessive accumulation in the air filter element and drainage bubbles. This condition will cause stalling, rough running, and hard starting. See this post on hard-starting for more information on this condition. This usually indicates that your air filter ought to be cleaned (washed and dried). A dirty, oily air filter doesn't do your engine any favors. 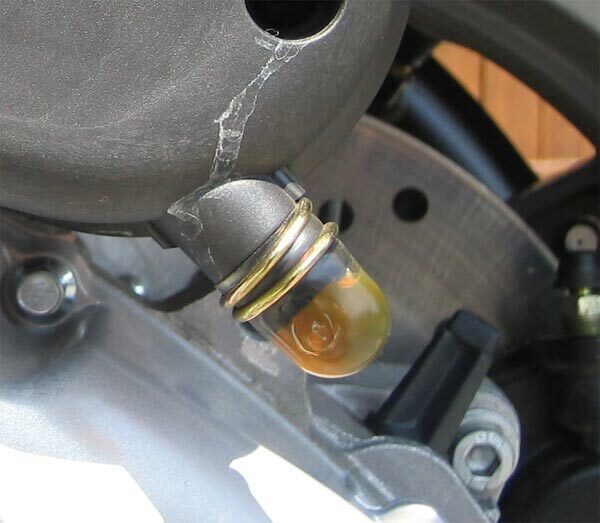 It can also occur if the scooter has been dropped on its left hand side with the engine running - a significant amount of oil can directly enter the filter housing. FAQ: I've lost that little bubble. What do I do?